Just over a year ago today, we pulled our young family out of a familiar neighborhood, a church we loved, two schools we’d poured our hearts into, and the comfort of being surrounded by a large community of family and dear friends. We took a leap of faith. It is one of the hardest things we’ve done as a family and has quickly become one of the most powerful journeys in our family’s life. 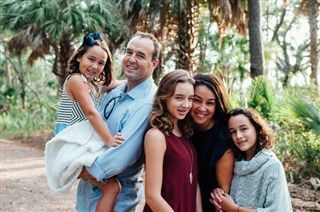 We are Stephanie Santos and Scott Songer, and we have three daughters (Isabella--9th, Elinor--6th and Nora--4th), enrolled in HHCA. We are writing to you on behalf of HHCA as part of our school’s annual fund campaign. What small leaps of faith do you make on a daily basis? A quick Google search defines a leap of faith as “an act of believing or attempting something whose existence or outcome cannot be proved”. Our leap of faith started when we were driving back from a fun New Year’s Day celebration with some good friends in our home state of Maryland. We’d been praying and soul searching for several years about the possibility of making a move. We felt that God was calling us to something new. A few weeks and several long discussions later, we connected on the phone with Ford Allen, who was HHCA's Board Chairman at the time. Ford’s message was heartfelt and clear. HHCA is growing, changing and chasing excellence every day. HHCA doesn’t claim to be perfect, but it is an amazing place of education and faith. Ford described HHCA’s differentiator as its steadfast commitment to respond to Jesus’ call to create disciples: To know Christ and make Him known. There’s a tremendous amount of positive growth underway at HHCA. We ask that you consider taking a leap of faith today by contributing generously to your children’s lives and to the HHCA Annual Fund. Give generously, give sincerely, give quickly. Take a leap of faith. Give. P.S. Every dollar you contribute is tax-deductible and goes directly into the school. Every dollar immediately impacts our children’s lives, our children’s education, and our children’s opportunity to learn more about Jesus.